Artist in Residence @ L'Artishe: Getting Ready For My Open Studio. Getting Ready For My Open Studio. You all know how I love a good tidy well today was no exception. Since my exhibition in March I have been hoarding my work in the studio. When it was all neatly packaged in portfolios it took up so little room. Now it is all framed in bespoke frames. It has to live in them, where do I find their new homes? Good question, one that I still don't quite know the answer to. Suffice to say that you can actually use both of the etching presses now. That's a start! I am an ideas person, I have several a day not all of them good I hasten to add. But I have a vision that with a little solidarity and some cross promotion the local art scene could step up to the next level. Oh the dizzying heights. I have said it before and I'll say it again that I want to be the destination that you see in the Guardian. As we have beautiful coastal walks, fantastic beaches, a plethora of galleries and some great pubs. What's not to like? I have had a video of the Life Drawing Class playing on a loop during this exhibition. I am starting to understand the pain that shop assistants feel in the run up to Christmas when the Christmas CD goes on at the end of October and is on steadily until Christmas Eve. 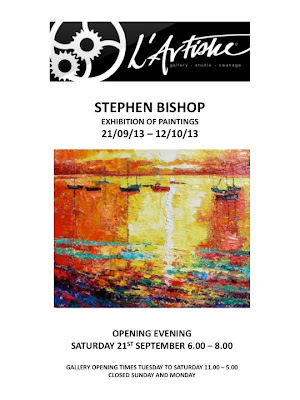 Gallery news....Stephen Bishop is coming to the gallery this weekend. 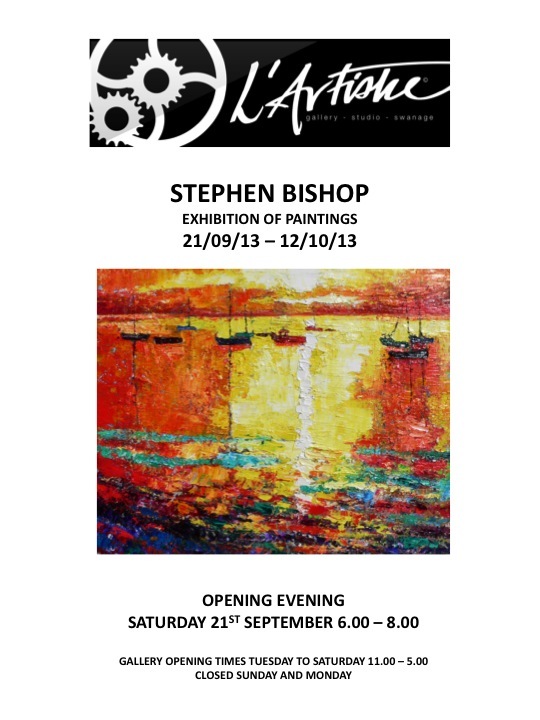 His show starts on Saturday at 6.00. I am excited about this as I understand that he has been working on some new paintings. It is nice to think that there will be some pieces that will be having their first outing at the gallery. You can say that you saw it here first. In other news there are just three weeks that are available next year between February and March. Then it is fully booked and I am now taking bookings for 2015. Yes, you heard me right. There will be a few necessary changes to the way in which the gallery is run next year as I need to increase the income. But I will reveal more about that at a later date. Tomorrow is your last chance to see the Life Drawing exhibition, if you haven't seen it yet then please do pop in and have a look. I Know What I Am Doing In January, Do You? I Have Never Seen So Many Naked People! I Only Wanted To Get To Work Early! Putting All Swanage Galleries On The Map!